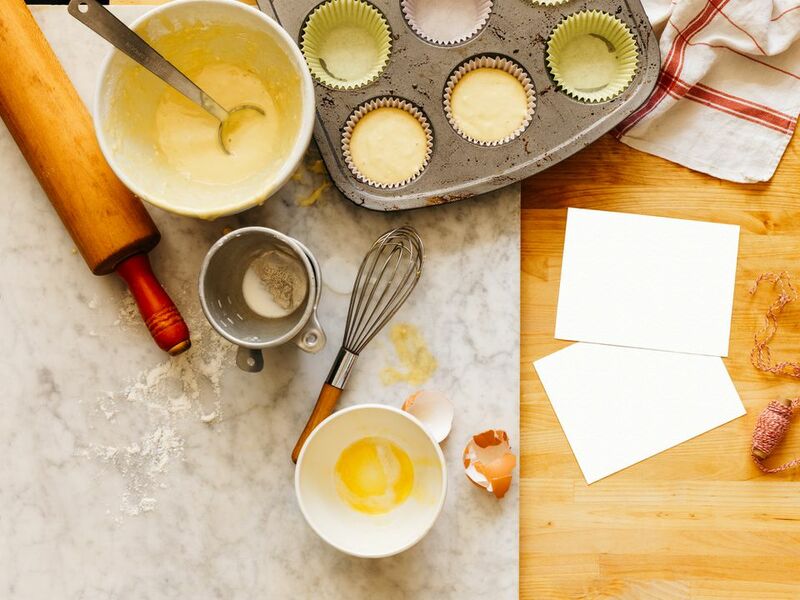 Baking and cooking are two very different kitchen skills. Generally speaking, you bake cakes, cookies, breads - anything with flour. And you cook casseroles, meats, soups, and vegetables. When you bake, you must follow the recipe exactly and measure carefully. When you cook, the recipe is more of a guide when you are more experienced. Substitutions are usually just fine in cooking. The very first step in cooking and baking is to read the recipe all the way through, from beginning to end. This way you will know that you have all the ingredients and tools on hand. You will also be able to look up terms you don't understand so cooking proceeds smoothly. Most good recipes start with the ingredient list, and the ingredients are listed in the order they are used. In this case, the topping is mixed first because breads and cakes that use baking powder need to go into the oven quickly after being mixed. If batters sit at room temperature before baking, the baking powder will keep reacting and the carbon dioxide produced can't be captured by the unbaked batter. And the cake or bread will not rise as high. Measurements in recipes are critical. When a recipe calls for a tablespoon or teaspoon, the author means for you to use actual measuring utensils, not spoons that you use for eating and serving. After you have read the recipe, gather all the ingredients, pots, pans, bowls, and measuring utensils you will need. Go slowly and double check all the steps and ingredients. When you are baking, dry ingredients and liquid ingredients are measured using different sets of utensils. Dry ingredient measures are usually plastic or metal. Liquid ingredient measures are usually glass, with a pouring spout and marks along the side of the cup. It's important to use the correct measuring utensil when baking. We are going to use this recipe for Quick Coffeecake to delve further into certain baking terms. The words with numbers next to them are discussed below. Preheat (9) oven to 375 F.
Grease (10) 13-by-9-inch pan and set aside. In medium bowl, combine brown sugar, cinnamon, and butter and cream together (11) until blended (12). Stir in oatmeal until crumbly. Set aside while preparing batter. Crack eggs into large bowl and beat with a fork until combined. Add milk and mix well with wire whisk or eggbeater. Add sugar and oil and mix with a whisk until blended. Sift (13) together flour, baking powder, and salt. Add to egg mixture and mix with a spoon for 20 to 30 strokes just until combined and all dry ingredients are moistened (14). Pour batter into prepared 13-by-9-inch pan. Sprinkle oatmeal mixture evenly over batter. Bake at 375 F for 25 to 35 minutes until puffed and golden brown (15), and a toothpick inserted in the center comes out clean (16). Packed Brown Sugar: Brown sugar must be pressed firmly into the measuring cup, then un-molded. The sugar should hold the shape of the cup when it's released. Softened: Butter is softened by letting it stand at room temperature for about 1 hour. You can soften butter in a microwave, but it's easy to overheat the butter. If the butter begins to melt, the structure that creates the little air holes in baked goods will be lost and your recipe won't rise as high. The texture will also not be as tender. Chopped Nuts: Chop nuts until the pieces are a uniform size, about 1/4" in diameter. You can do this with a chef's knife or (the method I prefer), a small hand turned nut chopper. Look for the position of the descriptor. If the recipe says 'one cup nuts, chopped' that means measure the nuts, then chop. Oatmeal can be substituted for nuts in many recipes. Milk: 1 cup milk is measured using the liquid glass measuring cup. Pour the milk into the cup, then bend down so the 1 cup mark is at your eye level. The milk should just touch the 1 cup mark, not be below or above. Sugar: 1 cup sugar is measured using the plastic or metal measuring cup. Spoon sugar into the cup so it's overflowing. Then use the back of a knife or a flat spatula and sweep over the sugar, level with the cup's top edge, so the measuring cup is full to the brim. Salad Oil: Salad oil is simply plain, unflavored oil. I like to use safflower oil in baking, although peanut oil and other types will work too. Do NOT use olive oil, as its flavor is too intense for baked goods. Flour: Flour is measured carefully in baking. Spoon it lightly into the measuring cup - don't scoop it out using the cup. Don't pack it or shake the cup. When the flour is overflowing the cup, use that knife again to level it off. Baking Powder: Baking powder and baking soda are two very different ingredients. Baking powder is baking soda mixed with another ingredient. Baking soda needs to be combined with an acidic ingredient like vinegar or lemon juice. Each produces carbon dioxide. (Don't panic - carbon dioxide is very safe. It's what makes baked goods rise!) Don't pack the baking powder in the spoon - spoon it into the measuring spoon and level off as for flour. Preheat: All ovens need to be preheated when you're baking. It should only take about 10 minutes for an oven to get to the correct temperature. I highly recommend an oven thermometer, since almost every oven made isn't perfectly accurate. Grease: Grease pans by rubbing them with a bit of unsalted shortening or butter, or spraying with nonstick cooking spray. The shortening should be a very thin, even coating over every inside surface - so the pan is shiny. No shortening should be visible. Or spray with nonstick cooking spray lightly and evenly. Creaming Method: Cream is a cooking term that means to push shortening and sugar together on the sides of the bowl using the back of a large spoon. This builds small air pockets in the shortening with the sugar crystals and starts to set up the product structure. A mixture is blended when you can't see the separate ingredients any more. Blending Together: Blended means that the mixture is stirred together until the individual components disappear. Sifting: Sift flour and other dry ingredients by placing them in a sieve and shaking the sieve gently. This removes lumps and blends the ingredients together. Moistened: Quick breads are mixed just until dry ingredients are moistened. No flour should be visible, but there should be small lumps in the batter. Everything will smooth out during baking! Remember, these instructions are just for quick breads. Golden Brown: Baking doneness tests are descriptive. The range of cooking times, in this case 25 to 35 minutes, has been established in tolerance tests in test kitchens. Begin checking your product at the shortest cooking time. Golden brown means more golden than brown. When breads, cakes and cookies are done, they usually look done. Browse through products at a bakery, and note their color. That's how your homemade goodies should look. Toothpick Test: The toothpick test is usually used to test for doneness. Stick a clean toothpick into the product near the center and remove it. There shouldn't be any uncooked batter or wetness on the toothpick. If there are small crumbs sticking to the toothpick, that's just fine.